Thérèse Woodcock worked as a librarian and a school teacher before training as a child psychotherapist at Dr Lowenfeld’s Institute of Child Psychology. She worked for 25 years in Child and Adolescent Mental Health Services in the NHS. She has taught at Cambridge and Middlesex Universities, where she is Director of an MSc Course in Lowenfeld Projective Play Therapy. This book contains the distillation of the author’s 35 years’ experience of using Lowenfeld Mosaics and Lowenfeld practice in the treatment of unhappy and disturbed children, in the investigation of children’ acculturation to alien cultures, and in working with the deaf. Through case studies, 80 colour mosaics made by children and adults are used to illuminate Lowenfeld’s theories. Mosaics are one of several non-verbal techniques invented by Lowenfeld to enable children to express their thoughts and feelings directly without having to find words. The circumvention of language attracted Mosaics to the notice of social anthropologists, such as Margaret Mead, looking for tools for cross-cultural research. The author gives a detailed account of how to set about using Mosaics in a clinical setting, how to introduce them to a young person, and how to discuss the resultant creation. The wide range of case studies presented includes the use of Mosaics to study the degree of comparative acculturation of samples of 12-year old Chinese children, in mainland China, London, and San Francisco. 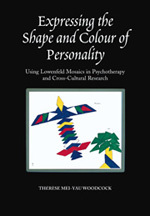 Thérèse Woodcock has taught the use of Mosaics to a wide range of professionals who work with children – child psychotherapists and psychiatrists, paediatric social workers, paediatric occupational therapists, speech and language therapists, play therapists, guardians, specialist nurses, workers with the deaf, among others. Expressing the Shape and Colour of Personality offers an opportunity to anyone working professionally with children or young people to benefit from her unrivalled experience.